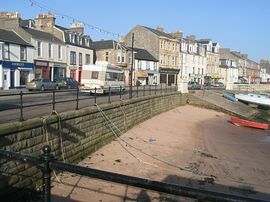 Millport is the only town on the Isle of Cumbrae, reached by a ten minute ferry crossing from Largs. 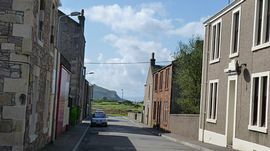 7 Crawford St is a ground floor, one bedroomed flat five minutes walk from the Blue Star beaches and shops, cafes and entertainments of Millport. 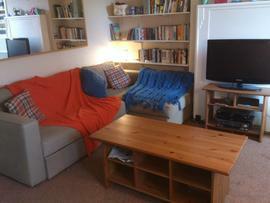 The flat is in a quiet location, and is a peaceful haven, with all you would wish in a holiday flat. We pride ourselves in our local knowledge, and making your stay- be it a fortnight, week, or out of season short break- as home from home as we can. The flat has a large living room with dining area, kitchen, bathroom and double bedroom, all recently refurbished to a high standard. 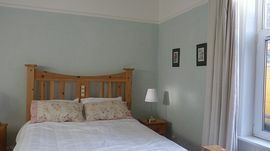 There is a double bed settee, and two double bed settees in the living room, and the bedroom has a large double bed, and ample space for either our double inflatable bed, or your own travel cot. There are night storage heaters throughout the flat. The kitchen is fully equipped with washing machine, microwave etc. The Isle of Cumbrae is a charming, friendly destination, popular with walkers, bird watchers, divers, fishermen and golfers- or families looking for a traditional seaside break. Quiet street, yet minutes from town. Towels also provided at small additional cost, if required. Well behaved dogs with their own beds are welcome! 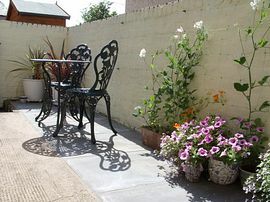 Shared back garden laid out to gravel, with bench , plus private patio area with chairs and table. Follow the signs for Greenock, then Largs. The journey takes about 50 minutes by car. There is an hourly train service from Central Station, which again takes about 50 minutes. Each ferry is met by a bus which takes you into the town, making it an easy holiday to use public transport. There is no need for a car once in Millport, although bikes are very popular! Please phone me for availability, and prices for short out of season breaks. I also run special offers throughout the year, or for cancellations. The flat is available for Saturday to Saturday from July till the end of August, plus short breaks of weekends or three or four night stays the rest of the year.